We form every one of our 5 million hair follicles by the 22nd week of fetal life. About 100,000 of these are on the scalp. This is the maximum number of hair follicles that will ever form in a lifetime because modern science does not currently know how to generate new hair follicles after birth. Recent research gives hope that one day we might be able to generate new hair follicles, but for now 100,000 is the maximum number of scalp hairs. 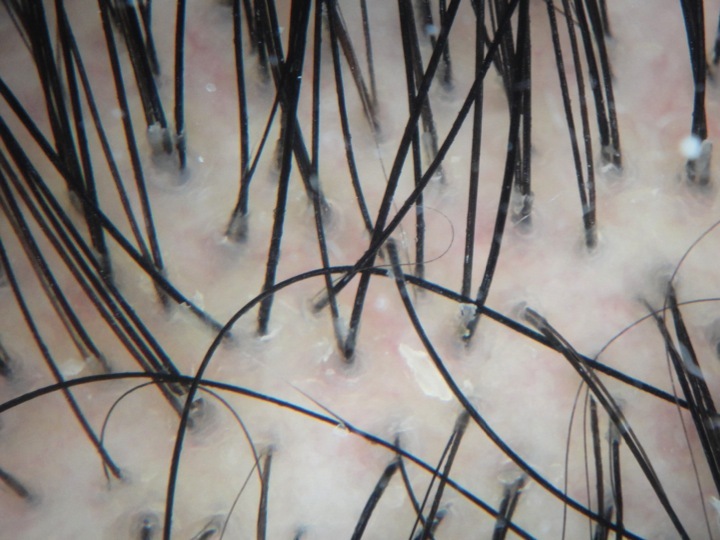 The living portion of the hair follicle is below the surface of the scalp. The hair above the surface of the scalp that we see everyday when we look in the mirror or look around at others is called the hair shaft and is not living. The hair shaft is composed of three layers - an inner medulla, and outer cortex and an outermost layer called the cuticle. The cuticle is a delicate layer and arranged like overlapping shingles on a roof. Hair with an intact cuticle layer looks shiny and healthy. The purpose of hair conditioners is to protect this cuticle layer. Hair on the scalp grows approximately 1 cm per month. Hair growth occurs in three phases: anagen, catagen and telogen. 90 % of the hairs on the scalp are in anagen phase, less than 1 % are in catagen phase and approximately 10 % are in telogen phase. Every day about 50 to 100 hairs complete the telogen phase and are shed from the scalp. This constitutes the normal level of hair shedding. Hair color occurs as a result of two main pigments: pheomelanin and eumelanin. Individuals with black or brown hair have greater amounts of eumelanin. Pheomelanin is found in greater amounts in those with red and blonde hair. Brown and black are the most common hair colors. 2 % of the world has naturally blonde hair; less than 1 % have red hair. Greying of hair is extremely common. By age 40, about 60 % of North Americans will have some grey hair. The age at which an individuals develops grey hair is strongly influenced by genetics. Hair on the scalp turns grey before beard hair, body hair or eyebrow hair. Grey hair may be due to an accumulation of hydrogen peroxide inside hair and intense research efforts are underway to block these effects.